Heart attack is a condition that many fear and wish to prevent. 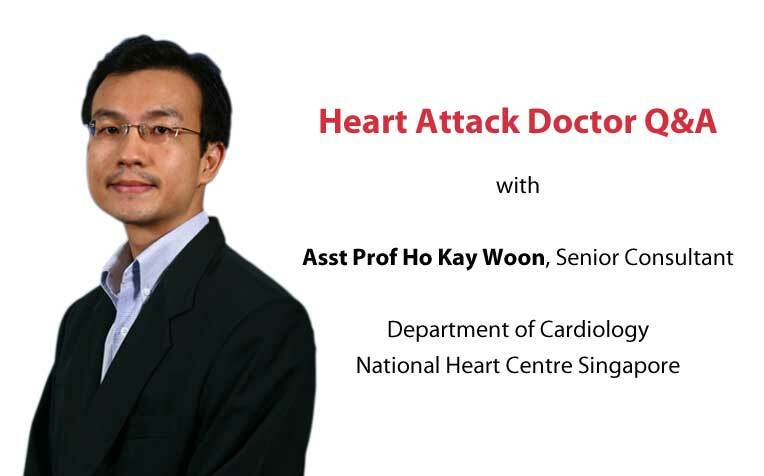 Take the chance to ask Assistant Professor Ho Kay Woon, Senior Consultant from the Department of Cardiology at National Heart Centre Singapore about heart attack. anything you wanted to know about heart attack. A heart attack, characterised by severe chest pain that radiates up the neck or down the left arm, is a condition that everyone fears. How do you prevent a heart attack? What can you do if a loved one has a heart attack? Are the symptoms of a heart attack the same for both women and men? Take the chance to ask Assistant Professor Ho Kay Woon, Senior Consultant with the Department of Cardiology at National Heart Centre Singapore (NHCS), a member of the SingHealth group, all about heart attacks. Update: This As​k The Specialist forum has closed. Thank you for participating. Assistant Professor Ho Kay Woon is a Senior Consultant with the Department of Cardiology at National Heart Centre Singapore. He is also Director of Medical Student Training in the Cardiovascular Sciences Academic Clinical Programme. Asst Prof Ho's sub-specialty interest is in interventional cardiology, particularly in the areas of percutaneous coronary interventions, transcatheter aortic valve replacement and device closure for perivalvular leakage.